Can you use the same antenna for cellular and TV? You can, but you probably shouldn’t. 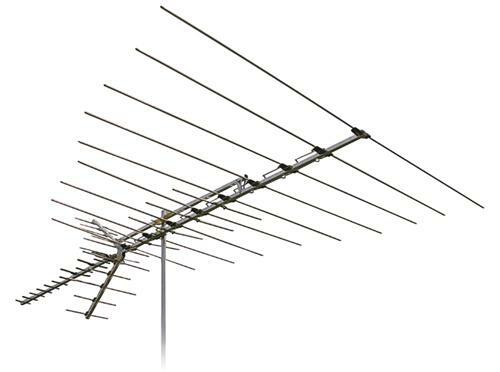 A large antenna like this one will probably do a fairly good job at picking up some of the frequencies used for cellular signals, which all sit above the current limit of UHF channel 51. Some of those frequencies actually sit around 700MHz which isn’t too far above the frequencies this antenna was designed for. Others, however, sit between 1900MHz and 2100MHz, which is far beyond this antenna’s design range. The funny thing is it probably would work in some ways, owing to a theory called “harmonics.” See, if you’re trying to get a signal, the best thing to do is to use an antenna that’s exactly the same length as the wave you’re trying to receive. That would mean an antenna designed to get VHF channel 2 would need to be about 18 feet wide! Luckily that’s where the “harmonics” part comes in. You can also use an antenna that’s 1/2 or 1/4 of the wavelength, making it possible for an antenna just about 4.5 feet wide to get channel 2 acceptably. Harmonics also work the other way. A 1900MHz signal has a wavelength about 6.2 inches, but that also means an antenna 12.4 inches or 24.8 inches will pick it up pretty well. So, one of the elements in that HD8200 antenna will probably be close to the right size for that particular frequency. You’ll get something there. The problem is that as well as harmonics work for you, they also work against you. It’s possible for different broadcasts to bump into each other and cause interference when their harmonics are close. When you combine that with the fact that cell signals are usually much stronger than TV signals by the time both get to your home, you have the potential for a bad situation. That’s one reason why modern antennas actively filter out cell signals that could cause a problem. The truth is that a single antenna probably isn’t a good idea when you’re trying to combine cellular and television, and outdoor cell antennas aren’t that expensive. You’re better off putting up two different antennas and running two different sets of cables. In some cases you can combine the outputs from both antennas into a single cable but circumstances vary wildly… why take a chance? How can you get a better guide when watching antenna TV?